Keycode All Almy marketing material displays a keycode which controls the price of items when you order. 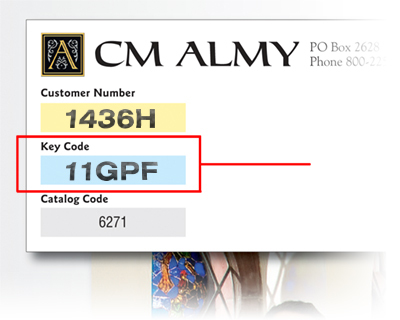 If you are using an Almy catalog, flyer, or email when you shop, look for the keycode, then enter it here and click Recalculate. If your keycode is associated with a sale, you will enjoy savings on the prices displayed on the site. Try it! On catalogs and fliers, look on the back cover or mailing address panel, in the blue-colored box. If the blue box is blank, enter the catalog or promo code in the gray box. On email offers, the keycode will be repeated several times in the message.